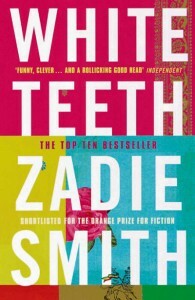 Zadie Smith’s first novel, “White Teeth” is set in the mid-50’s to 2000 era London and touches upon the many cultural influences brought about by a heavy influx of immigrants during the time. Smith has been praised for her first novel by many a critic and produced quite a splash in the media, especially considering how rough it is out there for authors these days. If I told you a little bit about “White Teeth”, I’d have to tell you a lot. And so with that, I can tell you this book is a rich, layered novel. It’s not a terribly long read, but the pacing is unique. Several characters, either active or passive (and stuck in a much debated history) ebb and flow in the story. Chapters divided by age, gender, ethnicity, and opinion break up the monotony. It’s impressive when an author can blend subject matter like English and Bengali identity, Jamaican Jehovah’s Witnesses, and scientific atheism, along with a husband and wife slugging it out in the back yard while another character debates the nature of fate and chaos. But that’s the point. From personal experience, I can tell you London is probably the most international city in the world. Smith seems to be aiming for more eclectic subject matter. Each character is given their own narrative, with unique story arches and themes. From a burned out Englishman and his twenty-something Jamaican (former) Jehovah’s witness to Bengali twin brothers alluding to the Cain and Abel story, White Teeth takes them all and throws them together in a complex city still dealing with it’s history of Imperialism. Characters clash over age, the past (or it’s interpretation), their own identities, and various outside influences that all reflect some aspect of Smith’s symbolism. That’s not to say that this book is devoid of comedy, far from it. Smith has a great knack for matter-of-fact humor. Her phrasing for characters is dead-on (especially the Jamaican accent) and the dialogue between characters is downright hilarious at points. There’s also a bit of situational humor for good measure. Picture a Muslim owning an Irish pub that refuses to sell pork in a city known for black pudding and you might get an idea of the diverse coming together of culture and identity. “White Teeth” not only shows how struggles can be produced in such an international place, but also provides a kind of “warmness” in it’s ability to show how comedic these differences can be. None of her characters are portrayed too harshly, though you may be aggravated by some of them, no clear villains (or heroes for that matter), just complex characters sprinkled with bits of stereotype living in Northeast London. There are clear, underlying currents here though. Polarity being one, the past coming back to haunt you being another. Smith enjoys taking a character from one spectrum to another. A religious girl loses her faith while her atheist boyfriend gains his, causing a divide from the same thing that brought them together (“I’m hear to share the good news with you”). A religious Muslim father living in London who (in his words) bargains with Allah “like a Catholic” (can’t say fairer than that), all while tirelessly defending his great grandfather, a “hero” (at least to him), who helped bring about the first (but unsuccessful) mutiny against the English occupation of India. Smith takes all of her characters down a path of growth (or disintegration), almost always tinged with hints of irony. Her diverse cast interacts with one another in poignant, but realistic ways. There’s definitely time set aside for stream of conscious inner dialogue and the narrator’s voice doesn’t shy away from coming through, but the pacing (at least for me) seemed intentional (but not forced) and driven. As the English say, Smith is determined to “get on with it”, despite (or perhaps because) she challenges herself with so many characters and situations. Smith’s foreshadowing of events is (thankfully) avoidant of in-your-face clichés, but exquisite in her timing and well thought-out ideas and symbolism. 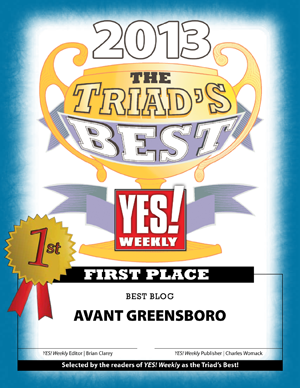 While it may be true that my bias is admittedly positive, a good book needs little defense. 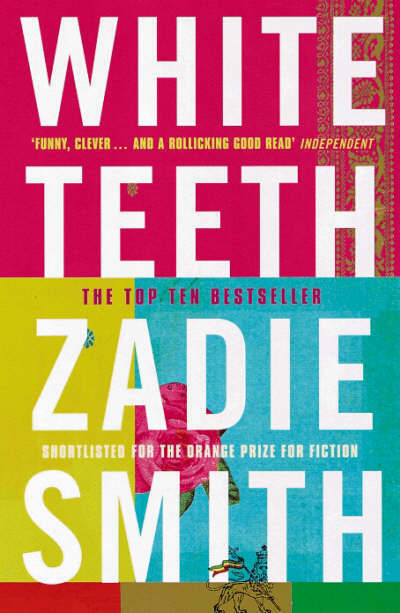 If you’re looking for a character-driven novel with a diverse cast, a peek into Northwest London, or just enjoy a good book, be sure to check out Zadie Smith’s “White Teeth”. Thanks for this…I really loved this novel! I wasn't nearly as impressed with her new one, NW, though. Have you read that one? Still, this was a hell of a debut. She could write nothing else the rest of her life and this would be a testament to the brilliance of her writing. Thanks Julie! I really enjoyed reading it. So many memories 😀 Haven't read her second effort, but I might give it a shot soon. Great book, thanks for the recommendation! Log in | 47 queries. 0.524 seconds.